Like Chicago from Mrs. O’Leary’s cow, or San Francisco from the earthquake of 1906, Atlanta has earned distinction as one of the most burned cities in American history. During the Civil War, Atlanta was wrecked, but not by burning alone. Longtime Atlantan Stephen Davis tells the story of what the Yankees did to his city. General William T. Sherman’s Union forces had invested the city by late July 1864. Northern artillerymen, on Sherman’s direct orders, began shelling the interior of Atlanta on 20 July, knowing that civilians still lived there and continued despite their knowledge that women and children were being killed and wounded. Countless buildings were damaged by Northern missiles and the fires they caused. Davis provides the most extensive account of the Federal shelling of Atlanta, relying on contemporary newspaper accounts more than any previous scholar. 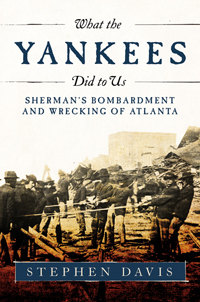 The Yankees took Atlanta in early September by cutting its last railroad, which caused Confederate forces to evacuate and allowed Sherman’s troops to march in the next day. The Federal army’s two and a half-month occupation of the city is rarely covered in books on the Atlanta campaign. Davis makes a point that Sherman’s “wrecking” continued during the occupation when Northern soldiers stripped houses and tore other structures down for wood to build their shanties and huts. Before setting out on his “march to the sea,” Sherman directed his engineers to demolish the city’s railroad complex and what remained of its industrial plant. He cautioned them not to use fire until the day before the army was to set out on its march. Yet fires began the night of 11 November—deliberate arson committed against orders by Northern soldiers. Davis details the “burning” of Atlanta, and studies those accounts that attempt to estimate the extent of destruction in the city. The “Burning of Atlanta” has taken on such mythical proportions that it long ago became separated from historical fact. In What the Yankees Did To Us, Stephen Davis has re-examined original sources and discovered new ones to re-tell the story but this time with feet planted firmly in reality. The result is the best and most accurate work on this topic to date. If you think you already knew about this famous chapter in Civil War history, think again.